The newest feature to the VirtualPBX lineup has received the prestigious 2018 WebRTC award for the VirtualPBX Web Phone. This feature allows users to make calls right from their web browser and gives them access to a number of exclusive features. What is especially exciting about receiving this award so soon after its induction is that we’re just getting started. 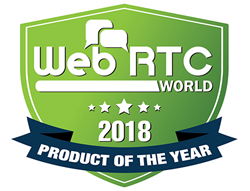 VirtualPBX announced today that TMC, a global, integrated media company helping clients build communities in print, in person and online, has named the VirtualPBX Web Phone as a 2018 WebRTC Product of the Year Award winner. The VirtualPBX Web Phone is the simplest way to make a phone call as it requires no additional hardware or software to begin and because it is browser-based, users never need to manage any updates. Introduced just three months ago in April 2018 and available for all VirtualPBX Dash Business Phone System users for free as part of their plan, the VirtualPBX Web Phone has been adopted quickly by existing customers. It has also gained significant traction in the VoIP market, where it’s ingenuity and low-barrier access outpaces the competition. Features already present in the VirtualPBX Web Phone include Call History, Company Directory, Call Transfers, Call Holding, and Quick Key Shortcuts. Minutes used are pulled from shared plan minutes and the VirtualPBX Web Phone can be used as a device in any call routing scenarios already present on a customer’s account. The only thing needed to get started is a VirtualPBX Dash Business Phone Plan. Through education, industry news, live events and social influence, global buyers rely on TMC’s content-driven marketplaces to make purchase decisions and navigate markets. As a result, leading technology vendors turn to TMC for unparalleled branding, thought leadership and lead generation opportunities. For more information about TMC and to learn how we can help you reach your marketing goals, please visit http://www.tmcnet.com.